It's spring in the patch and here is what is happening. I have just started to pick my first baby radishes of the season. I deliberately pick them small as this is the first thinning I do. I sow thickly and only thin when the first small round roots have formed. Then there is more room for the others. Dipped in hummus don't you think? And Collette the finger lime is flowering like crazy and starting to set their tiny fruit. It will turn black soon and hopefully start to thicken. The fruit that set in March either fell off or was stolen by a curious currawong? I grow a lot of flowers in my vegetable patch, I just like a little bit of colour and they do bring the bees. Right now the violas are spectacular. And my self sown poppies are just starting to flower. I collected seed for these poppies many years ago now when I came a cross a deserted house with a wild garden in Tarcutta (or was it Holbrook? ).We were on our way down to the Wangarratta Jazz Festival and stopped off for a rest and a coffee. The round dried heads of poppies were just beautiful and so I collected some. I didn't know what they would produce, but I love the colour of these blooms and the grey green of their foliage. When they have dried off I collect some dried heads to take inside as a dried display and sprinkle the seeds where I want them to come up next year. They just keep coming up every year, where ever they want to regardless of my attempt to place them in certain locations. I try to make space for them each time as they are great bee magnets. The bees circle around and around inside the cup of the petals, it's funny to watch. And my thyme is flowering, also bringing bees. They are such a delicate mauve. This bunch came inside and went into last night's meal. This is the third and last planting of my snow peas. There is plenty of really good fruit to come and plenty of flowers. But they will soon be finished and I will have to wait for the cooler season for them again. Heaven on a stalk. You smell them before you see them and then when you see them you despair. Stink bugs. I HAVE to do something about these blighters today otherwise there will be no limes. You can see them sucking the stems behind the newly set fruit. They will be come the subject of an entire post. This poor lettuce was ravaged overnight! Turn your back and they slime out of their hiding spots and munch. It only took one warm day and the frogs got going! Does what you pick from your patch drive what you cook? Or does your cooking drive what you plant? A bit of both I guess? Two years ago I decided to try to grow celery. I decided to try to get those fat juicy stems - like the ones you get when you buy from the supermarket. My efforts failed pretty badly - for a couple of reasons. 1. El Nino - Celery is a water hungry plant and, as it was a El Nino year, and I felt bad pouring loads of water on, so I plain didn't water it enough to get those thick stems. 2. Blanching - I decided to do what it said in some of my gardening books and I tried to blanch the stems. The method I chose was to tie the top of the stems together so that the inner ones were kept from the sun. This was fine in theory, but what I found was that insects of many sorts decided that I had created a cosy over wintering spot for them. Then the plants started to rot in the centre. Thinking this out made me realize that I didn't really need thirsty fat juicy white stems at all. Stock and meaty sauces don't require them and neither do Chinese dishes using celery. Thinnish stems that were greener and packed with flavour rather than water would be just fine for my purposes! So I decided to grow celery again but this time not set off in a quest for the fat juicy white stems, so I didn't blanch and I didn't water like crazy. The plants look healthy, they haven't rotted inside and there are no over-wintering insects. Yay! The stems are thin but packed full of flavour, they are green but I have read that the greener stems are actually more full of nutrients. Armed with my celery stems I made one of my favorite dishes - Chinese-style beef and celery. I apologise for the lack of quantities - I make it up as I go along. Heat olive oil in the wok. Stir fry ginger garlic chillies and celery, when the celery has softened, toss in the beef and spring onions and cook till meat is nearly cooked as you like, toss the snow peas in with a splash of soy. How do you grow your celery? What do you cook your celery with? You may have read in my post Crochet and the Fairy Godmother that, after many years of avoiding knitting and crochet becasue of severe RSI, I have returned to the 'way of wool'. The crochet is going just fine, in fact brilliantly! I will blog about this next week. In the meantime I thought I'd try a small knitting project to see how the arms stood up with that discipline. I decided on a tea cosy - pretty small job and also with the potential of a fun outcome. I must say I DO find knitting harder on my arms than crochet, but still a small project yields results without too much pain or damage. The wool is from Fairy Godmother Ruth's shop in Newtown, Sydney again and this is her 'homebrand' wool, Morris Estate 8 ply in Spruce for the main body and with the flowers in Marine Green, Rustic Aubergine, Limelight, Imperial Purple, Aegean, Canopy and Dark Dijon - nice names for colours. I love the stitch for the main body - a seed rib - it is thick and stretches so wonderfully around the tea pot. The flowers are pretty easy to make the worst part being casting on 100 stitches! Is it just me or does everyone hate casting on? The pattern is Coral Flower Tea Cosy found on Ravelry. The pattern suggests more flowers, but I think this is enough for me. I am contributing this to My Creative Space. See what others have been tinkering with. Is this evidence of a currawong tanty? Or is it garden art? We went away for the weekend and I guess the currawongs decided that they'd look for food themselves. In the past they have tried out the little 'worms' that come out of the top of the tea lights... humans would call these wicks. I think the placement of the tea lights demonstrates an artistic bent, don't you? Dadaist perhaps? A critique of middle-class house decoration? A demonstration of the uselessness of tea lights outside? Or the currawong's improvement of my home decorating? Perhaps it's just plain vandalism? What do you think these pieces of art mean? Or is it just a tanty! But what I am really confused about is this - where is the third tea light? I have found where two have been placed, but the third one? Perhaps it decorates a currawong nest somewhere? You can read about my currawong friends here and here. My pickings at the moment reflect where we are in the season. My second planting of winter crops is now coming into maturity. 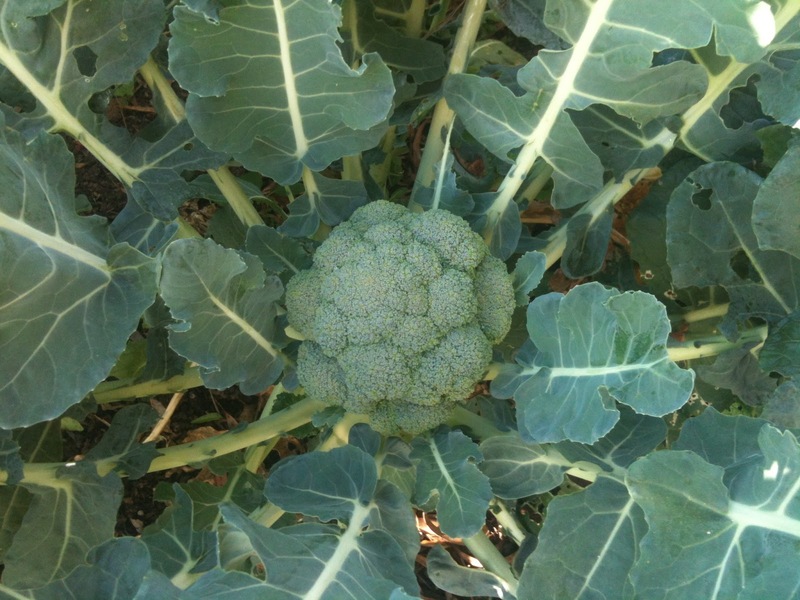 This week I picked, one decent sized cauliflower, 3 smallish heads of broccoli (just one in this picture) and the first picking of my third crop of snow peas. The other things I picked reflect the start of the summer crops. These are trimmings really rather than pickings, which will go into a salad for tonight's dinner. I thinned my beetroot a little - you can see that the roots had started to form. I will eat these leaves. I also took the best leaves off the celery. Do you like celery leaves in your salads? Then I trimmed my lime green lettuce plants, snuck a little off the baby curled parsley and picked some mint. I think this will all make a great green salad with some semi-dried tomatoes a crumble of fetta and a slick of vinaigrette. I am contributing this to Daphne's Dandelions Monday Harvest. I don't know about where you live, but the strawberries are incredibly cheap at the moment. I don't have any strawberries in my patch, but seeing as there is a glut of Queensland strawberries at the moment, I have decided to cook their glut. I decided upon strawberry jam - funny, cause I don't usually like strawberry jam, I find it too sweet. But I figure that home-made strawberry jam tastes better than shop bought any time and I can make it less sweet than the shop bought variety, even if the strawberries have travelled a long way to get to me. I got 6 large punnets for the price of 5 of strawberries - a discount becasue I bought so many and it was the end of the day, at $2.50 each. I decided to make my own recipe up, cause I like things a litle tart, I used half the sugar to the fruit (most recipes call for equal sugar to fruit) and added lemon juice and some tart apples. The rind of the lemon and the apples assist with the thickening as strawberries on their own have little pectin. Choose a heavy-based saucepan, tip strawberries in and add lemon rind and juice, cook on for a bit until strawberries soften a little. Add sugar and apples, stir and 'bloop' on a medium heat, stirring occasionally to make sure it isn't sticking. The jam kind of tells you when it's ready - it changes colour and consistency. To test, take a cold bread and butter dish and spoon some jam mixture onto the plate. Let it cool and push it with your finger. Does it wrinkle and sort of hold the wrinkle? If so your jam is done. Remove the lemon rind and spoon into hot sterilised jars and seal. I got 5 jars from the 6 punnets. Nice dark red in the jar, hey? The jam is not exactly tart, but it is delicious and much less sweet than the shop bought, much better for you per spoonful given it has less sugar. But tell me if you know - how low can you push the fruit /sugar ratio? I'd like to go lover than 1/0.5. What have proportion have you used with your jam making? early spring thing it is. Today I picked three (small) heads of broccoli. They are smaller than the first crop earlier this season, but tight and tasty and firm. I think I might have mentioned the lad's part Italian genes? Well I suggested orecchiette as a natural accompaniment to broccoli and, with a flick of hard pasta flour, down to work he went. The recipe came from Stephanie Alexander's Kitchen Garden Companion, handily listed under, you guessed it, broccoli. As almost always we varied the recipe, so our version appears below. Mix ingredients and knead till it comes together. Rest and re-work and form into thinnish sausage-like rolls. Cut into small pieces and form 'ears' by pressing the small piece of dough in the palm of your hand. The original recipe included ricotta but we didn't have any so we omitted it. This may have been a fatal mistake! Boil water and add pasta to boiling water and boil for 5 minutes. Remove from pot and drain. Cut broccoli into florets and steam lightly. Keep aside. Add bacon to a frying pan and cook on until the colour starts to brown. Add garlic and saute, and then add anchovies and melt. Add broccoli and chilli and combine. Tip in drained pasta , add butter and parmesan and mix. Serve. This was delicious, but the pasta was a little heavy. It would have benefited from lightening with the ricotta. But the combination of broccoli, the saltiness of bacon and anchovies, the vigour of garlic and chilli makes this pretty delicious. We've been buying each other gifts for the farm. I bought the lad this book full of helpful hints. And the lad bought me this giant Stephanie Alexander edition with natty cloth cover - I guess to keep the grubby dirty gardening hands off! Are there books you swear by? Books handy for your chook raising, fruit tree tending, soap making, cheese cultivating, kitchen cow keeping - I guess not many of you keep a kitchen cow. Books that we might find useful for our new adventure? Yesterday I picked my first of the second planting of caulis. My first planting, planted in January, suffered a little from whiptail but, while there were some caulis on the small side, many of them were quite decently sized, in any case we certainly had enough caulis not to have to buy any through the winter. They all had tight curds and were beautifully white (and delicious!). The last of them came out in early July. On reflection it was a pretty good crop despite my early fears of no heads at all because of whiptail. The photo on the top is of the best of my January planting. My second planting, planted in July and into the same beds that the first planting were in, are decidedly small and a little yellowed but still with tight curds. The one on the right was the size of a small bread and butter plate. I suspect that they are on the small size because they went into the same bed as the 1st wave? I did manure and lime in between but perhaps the caulis had pulled what they wanted from the soil in the first planting? Not sure what conclusions to draw here, so at the moment these are observations for further cogitation. Any ideas? I will be picking the first of my 2nd broccoli planting soon too, I wonder if they will be on the small side too? I haven't posted for a while - there are a few reasons for that. They involve self-imposed anxiety, cleaning and a secret. I started this blog in January when, on a long summer vacation, I was having trouble with the idea of going back to work. I decided that if I started a blog and wrote about the things I love about my veggie garden, I would have something to distract me from the thought of having to selling my labour. When I started, I didn't know what a blog was, I was technically incompetent and I didn't know there were others - yes like you - who write about their garden and the joys of their produce. It's been fun exploring the blog world, reading your blogs and learning from the things you do and from reflecting on my own mistakes. I started by putting a limit on the blog - just a year - and now that the year is 3/4 over, I cant imagine stopping on 31st December. This bit is about cleaning. We have been very very busy, cleaning, painting, shining, sweeping, buying flowers and hiding things in cupboards. You may have guessed what we have been up to? We have sold our house. "So what has this got to do with 100 years? ", I hear you asking. Ours is a fabulous Federation house (for those not from Australia, 'Federation' is an Australian style of architecture hatched around the time when our separate states came together in a Federation and when Australia became independent from Britain in1901). Our lovely was born in 1915 - so she is nearly 100 years old. This is the view from the backyard back to the house. This house is loved. It is a treasure of original features - fanlights and irons, fireplaces with art-nouveau tiles, coloured glass and patterned ceilings. We have nursed her back to her glory from a shabby, neglected state and she is now so pretty. It is hard to sell it, but we have sold to people who we know will love her as we have - a bonus and a comfort. We hope they will love her well past her 100th year. "So why did you sell?" - Gosh, you ask a lot of questions! Selling has allowed us to make a huge lifestyle change. I no longer have to sell my labour ( but I can chose to do that if I wish). And it has allowed us to do something we have wanted to do for a long, long time. This is the secret - not a secret any more! We have bought a property in the country. So I guess we will be busy for the next few months too. For the next while I will be doing a lot of my veggie gardening in pots so I can take them with us. I may not be in paid labour but there will be lots of labour to make the property work for us. I have to contemplate gardening in frosts and work out how to beat the 'roos and rabbits to the glut. There will be wood chopping, wombat watching, yabby catching from the dams and droughts and flooding rains. If you are still interested, I will still be blogging from my patch in the bush! Here are some of my observations from this winter. this year I was rubbish at having something to pick in late winter - I still have my second crop of brassicas in the ground and only now forming heads!